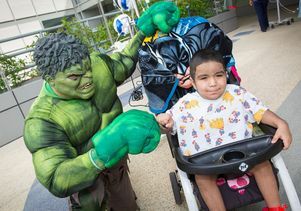 The Hulk fist-bumps with 7-year-old Herold Trejo, a liver transplant patient who has been in the hospital for 10 months. The annual Superhero Day at UCLA is a welcome respite for children and their families and a rewarding experience for the costumed window washers. Kids at Mattel Children’s Hospital UCLA received a sweet superhero surprise today. 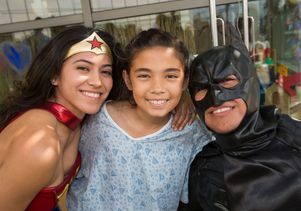 Descending three stories from the roof of the hospital to a fifth-floor terrace, window washers dressed as Batman, Captain America, Spider-Man, the Hulk and Wonder Woman entertained and posed for photos with young patients and their families at the third annual Superhero Day at UCLA. 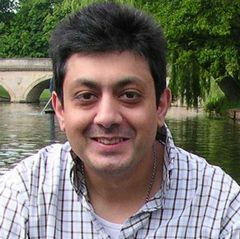 For 10-year-old Sky Assaf, today was a banner day. 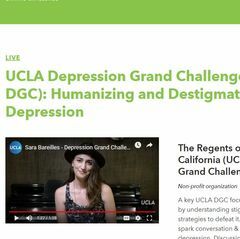 The little girl was supposed to be in surgery but was feeling well enough for her UCLA doctors to postpone her procedure. Instead, Sky got to meet her favorite superhero — Wonder Woman. 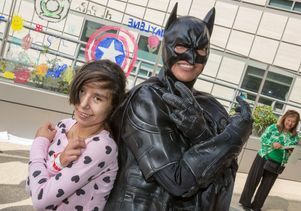 “This is icing on the cake that she also gets to meet these superheroes,” said her mother Dr. Marlice Patam, a UCLA oral and maxillofacial surgeon. The hospital’s window-washing vendor, Sunland Window Cleaning of Brea, California, created Superhero Day at UCLA in 2013 and once again donated its services and provided costumes for the event. The window washers said they found it very rewarding to bring smiles to the faces of the pediatric patients, many of whom are coping with serious illnesses that require them to be hospitalized for weeks or months at a time. A young patient with a hearing impairment teaches Batman the sign for his name. 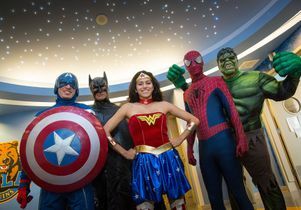 "It’s really gratifying to see how this event brings the kids outside of their rooms and makes them smile and feel happy inside," said Sylvia Pulido, who dressed up as Wonder Woman for the second year in a row to cheer up her pediatric fans. Pediatric liver transplant patient Herold Trejo, 7, got to meet his favorite superheroes, Batman and Spider-Man. He also fist-bumped with the Hulk. The special visit was a welcome respite from Herold’s 10-month hospitalization and brought big smiles to his mother and sister as well. 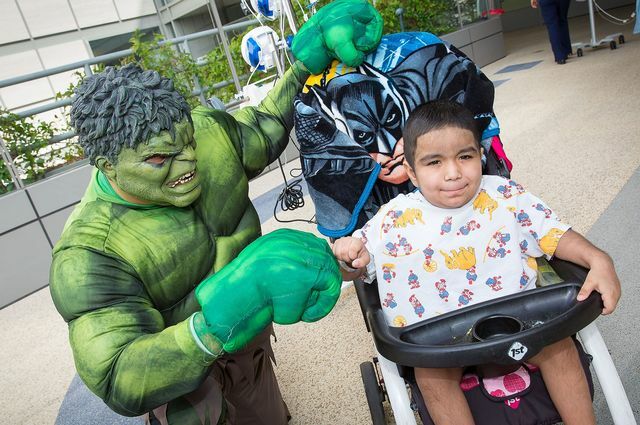 Kellye Carroll, director of the Chase Child Life program at Mattel Children’s Hospital UCLA, said she’s watched even the sickest kids come alive when they’re face-to-face with the superheroes. She called today’s superhero visit “life-changing” for many of the patients. Herold Trejo is a liver transplant patient at Mattel Children's Hospital UCLA. Window washers dress up as superheroes to cheer up patients at Mattel Children's Hospital UCLA. It's the 2015 Superhero day at UCLA for patients at Mattel Children's Hospital. 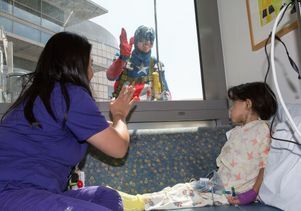 Captain America was one of the superheroes participating in the annual visit to patients.